Sorry for the long time between toy reviews, we know it has been a little while, but I think it’s time to review some of our favorite toys again! Today’s toy is going to be The Little People Toy Farm Set (the official name is the Fisher-Price Little People Animal Friends Farm….but i’m not going to type that every time). This is a toy that we let our son pick out after he had to have tubes put into his ears. He could have picked almost anything he wanted, but it was no surprise he picked this one since it was large, he loves farms, and he loves animals. 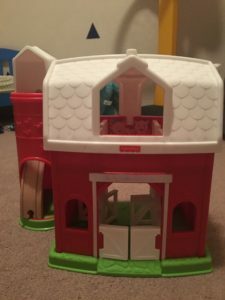 This toy quickly became one of his favorites, and the barn has morphed from only being used for farm animals to a fortress he uses for all sorts of different toy time adventures. This Little People’s toy farm is recommended for children between the ages of 12 months and 5 years. The barn does require some slight installation. There is a long pin that needs to be inserted to attach both sides of the barn together. This is super easy and will take about 30 seconds to complete. Once the barn is attached together, it opens and closes – and it has a handle on the top of it that makes it really easy to carry around when it’s closed. It serves as its own storage container – which is nice. Of course a barn/farm toy wouldn’t be complete without animals. This toy comes with your standard farm animals – a horse, pig, goat, cow, chicken, sheep, and farmer Eddie. You also get a bale of hay! The barn itself has multiple comparments for the animals. The bottom gates will make noises including animal sounds when they are opened and closed. The barn has a silo on the right side of it that has an opening on the top and bottom. It is perfect for dropping animals into and out of it. The setup is super easy, it’s very durable, and it comes with a great starter selection of animals. At the end of the day, your child is going to love using the barn as part of a farm – or using it as a fort for other toys! This is one of the safest toys we have ever reviewed. The animals are too big to choke on, there are no wheels on it so my child couldn’t use it as a roller skate, and it’s not flat – so it can’t be used as a step stool to climb on or jump from. Well done Fisher Price – it seems like you thought of everything with this farm set. The only thing my child has managed to do was pinch his finger once while closing it. To be honest I don’t know how he did it, but he is skilled like that. I give this toy a 2 on the danger scale. Unless your child grabs it by the handle and swings it around as a weapon (hopefully this never happens to you) than you will have nothing to worry about. This is the least annoying of the Little People Toys we have reviewed so far. The sounds it makes are soft in volume – and aren’t crazy annoying songs like the toy airplane! It is also an easy toy to assemble, so there is no stress there. The toy isn’t dangerous so you don’t have to watch your young child constantly while they play with it. The toy is easy to play with, so you get some really good independent play time out of it. All of these reasons are why I give this to toy a 1 on the annoyance scale. It’s hard to get annoyed by this toy, unless you have a deep down anger towards farms or farm animals. I debated between giving this toy a gold star or a silver star. It does score exceptionally well on the danger scale and parents annoyance scale- which are big factors in our grading system. 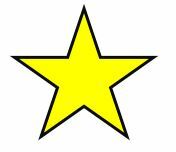 Since my child really loves this toy, and has adapted it to uses beyond just being a farm set, we are going to go with the gold star rating. If your child loves farms and animals – or Little People Toys, they are going to play with this toy for a very long time.